The WHRO STEM Van is ready to come to your kindergarten and first grade classrooms. A visit includes a lesson based on where you are in your curriculum. Certified teacher and WHRO staff member Martha Razor will work with your teacher(s) to determine the topic. Martha will design a special lesson that will include: a book reading, a hands-on activity and a PBS KIDS game to play on iPads. The entire lesson can be done in an hour. WHRO has 20 iPads that are brought onsite to your classroom for the children to learn while having fun. 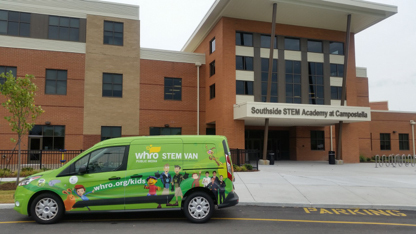 Students will also get a chance to go outside and see the outside of the WHRO STEM Van and have their picture taken.